From an old volume of the History of Chicago published in 1885, we find that the church was founded at the suggestion of Adam Sohn and William Kohlmann. Going among the German Protestants of the southwest section of the city, they found about one hundred and seventy five favorable to the enterprise. The success of their search was reported to Pastor Hartmann. On the corner of Twentieth Street and Wentworth Avenue was an English school, the use of which was given gratuitously to Pastor Hartmann. There the first meeting was held, and the first Church Council elected as follows: Adam Sohn, chairman; William holz, treasurer; George Martin, Gottlieb Holz, John Beierlein, A. Diesel, Fred reb el, Peter Metzger and George Kolbe, elders and deacons. Pastor Hartmann, for half a year, preached in the school house. The Reverend Joseph Hartmann, pastor of St. Paul's Church (LaSalle and Ohio Streets), saw clearly the distress of these, his Macedonians, and decided to come over and help them. In the summer of 1861, he and his faithful parochial teacher, mr. L. Falk, began to hold mid-week services for their benefit every Thursday evening in a public school on Archer Avenue, near Twentieth Street. No matter what the weather, what obstacles thee were, these two men were always at their post on Thursday evenings. They were content at first with the hope of founding a school, but the attendance at these services was such as to warrant founding of a church. And thus at the request of Pastor Hartmann, the Reverend Frederick Menzel took charge of the field. This was in 1861. The first church was dedicated to the service of the Triune God on the 9th of June, 1862, which was the day of Pentecost in that year. it stood on leased ground -- strangely enough -- on the corner of Archer Avenue and Twenty-first Street. This much is certain; but as there are no records or minutes prior to July 18, 1867, many events and dates must be gotten from other sources or left to conjecture. It appears that Pastor Menzel was in charge of the young church for four years, until about April, 1865. Not only was a church built in this time, but a school was established, which flourished so well that a regular teacher could be employed to relieve the pastor of his extra duties as teacher. 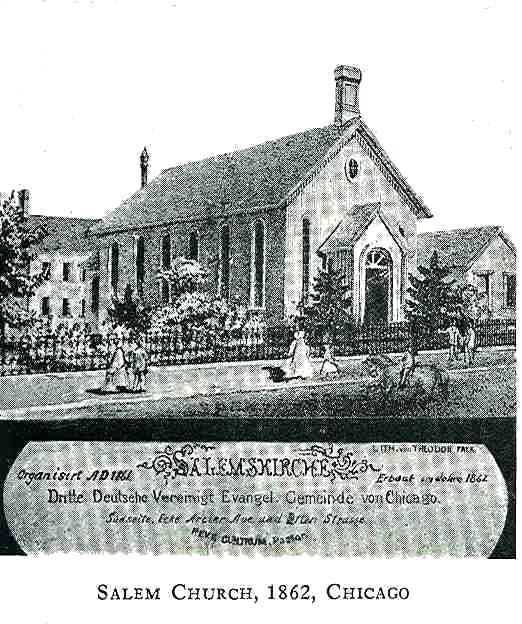 The church was called the Third German United Evangelical Lutheran Salem's Church. Later the term Lutheran was dropped and with the passing of the years the name was shortened until it became the Salem Evangelical Church.